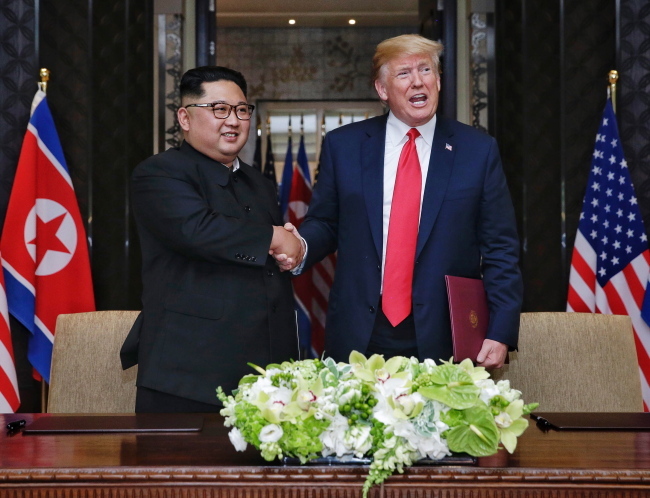 SINGAPORE -- US President Donald Trump and North Korean leader Kim Jong-un's historic summit on Tuesday signaled the start of warming ties between Cold War foes and the possible onset of peace on the Korean Peninsula. Trump and Kim met on the resort island of Sentosa, Singapore, against the backdrop of North Korea's nuclear weapons capability that Trump has vowed never to allow to hold the United States hostage. 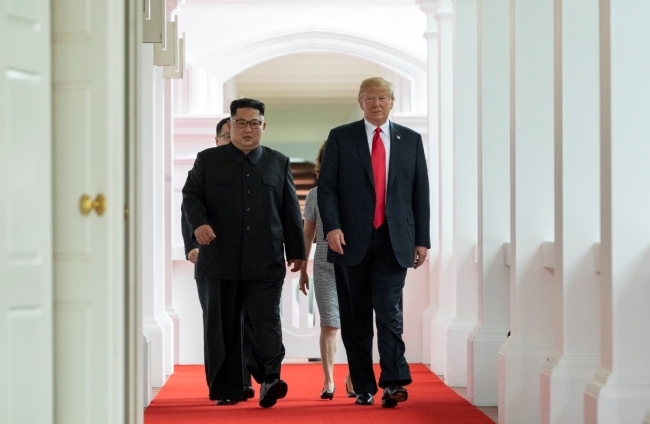 Belying the somber theme of their meeting, the two leaders smiled, shook hands and exchanged pleasantries about how they will have a "terrific relationship" (Trump) and how the world might view their meeting as a scene out of a sci-fi movie (Kim). The first sit-down between the leaders of the Korean War adversaries produced a joint statement calling for the "complete denuclearization" of the Korean Peninsula and the start of "new" relations between the two countries. It fell short of Washington's longstanding demand for the "complete, verifiable and irreversible dismantlement" of the North's nuclear program and didn't offer a detailed timeline for when denuclearization would take place, but it created space for the two sides to move forward into a cooperative relationship. "President Trump committed to provide security guarantees to the DPRK, and Chairman Kim Jong Un reaffirmed his firm and unwavering commitment to complete denuclearization of the Korean Peninsula," the statement read. DPRK stands for North Korea's formal name, the Democratic People's Republic of Korea. It also said the two countries will "join their efforts to build a lasting and stable peace regime on the Korean Peninsula." A signing ceremony attended by the two leaders capped their highly anticipated meeting. Trump had more to gush about at a press conference that lasted over an hour before a room of skeptical journalists. "The past does not have to define the future," Trump said. "And as history has proven over and over again, adversaries can indeed become friends. We can honor the sacrifice of our forefathers by replacing the horrors of battle with the blessings of peace." In particular, he voiced hope to formally end the 1950-53 Korean War, which left the two sides technically at war following the signing of an armistice, not a peace treaty. Establishing diplomatic relations between Washington and Pyongyang could be "a little bit early" but will happen "hopefully soon," he said. In what was seen as a major concession to Pyongyang, Trump also said he will stop "war games" with South Korea, referring to joint military exercises that have long irked the communist regime. He called the exercises "provocative" and "expensive," appearing to buy into the rhetoric used by Pyongyang. Another agreement Trump made a point of highlighting was their commitment to recovering and repatriating the remains of American soldiers killed or missing in action during the Korean War. Trump said he raised the North's human rights abuses in his talks with Kim and came away believing the dictator "wants to do the right thing." If all goes well, the president held out the possibility of meeting Kim again at the White House, an invitation the North Korean leader accepted. On visiting Pyongyang, he said, "Well, at a certain time, I will. I said that will be a day that I look very much forward to, at the appropriate time." And in the weeks before that, North Korea threatened to pull out of the meeting over suggestions from US National Security Adviser John Bolton and US Vice President Mike Pence that the regime would ultimately meet the same fate as Libya's collapsed government if it refused to denuclearize. The summit was arranged in a flurry of diplomacy after Trump in March accepted Kim's invitation to meet, a decision that took even his aides by surprise.